@nemestrinus , damn that's cold. It'd be one thing if I just tried to upload it earlier the same day, ya know maybe they didnt get to it yet...but it's been pending for about a week. @Not him again, they probably just post in order. 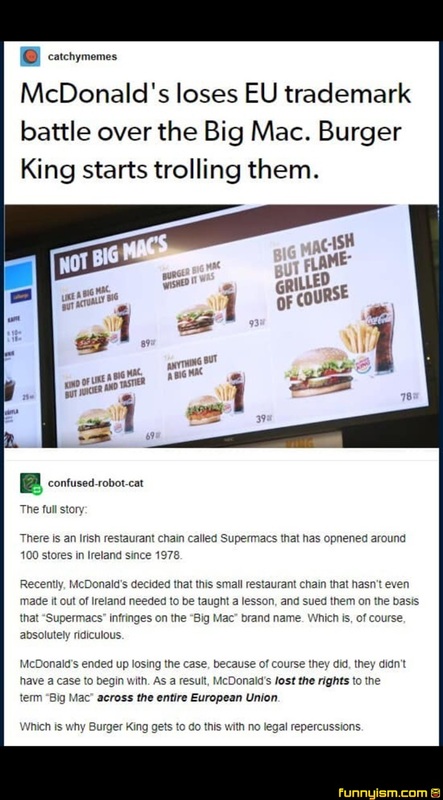 They should have one called, “Okay this one’s a Big Mac” and have it be a Big Mac but made with better ingredients. To be fair if you don’t defend your trademarks you lose them. So sort of a lose-lose situation for McDonalds either way if this true. Well they flippin' burgered that court case (ketch)up. They got the fry-t of thier lives when they lost, I bet.